Can overpower, recommend 5-10% range for wearable fragrances. Cinnamon Bark Oil has a warm, spicy scent that is somewhere between clove and cinnamon. It is slightly herbaceous with pepper notes. Cinnamomum zeylanicum originates from the island Sri Lanka (formerly called Ceylon), southeast of India. It is a tropical evergreen tree of the laurel family growing up to 15m (45 feet) in the wild. The Cinnamon Ceylon tree has a very thin smooth bark, with a light yellowish brown color and a highly fragrant odor. The traditional use of Cinnamon Bark Essential Oil is highly respected, because of the antiseptic and antimicrobial properties of the oil. It has been used to treat diarrhea and other problems of the digestive system. With its pleasant scent, it has been considered to be a perfect additive to creams, lotions, and soaps. From a spiritual perspective, it is believed to have a warming and uplifting characteristic. Cinnamon is native to the Indian subcontinent. Portuguese traders discovered Ceylon (now Sri Lanka) at the end of the fifteenth century and impacted the restructuring of the traditional production of cinnamon by the important Salagama caste whose professions were production of cinnamon, soldiering, and weaving. 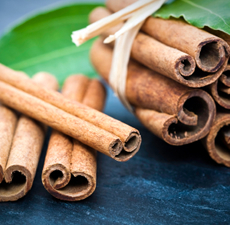 Cinnamon Bark Essential Oil can be irritating to the skin and mucous membranes - particularly in large doses. When using this oil, care must be taken because of the amount of active ingredients (compounds) it contains, and potential side effects from phototoxicity and sensitizing must be kept in mind when treating a client. It should always be used in dilution. Avoid use during pregnancy.